Welcome to the Pima County Genealogy Society! Global Research. Local Education. Your Genealogy. Join us on Saturday, April 20. The meeting will start with a short graduation ceremony for our first Genetic Genealogy in Practice Class of 2019. This seven month course was skillfully led by PCGS members Everett Johnson and Kathleen Carter. The commitment made by the instructors and students alike to complete the course and all assignments was difficult and deserves some recognition. Join us in congratulating them in their achievements. Our featured program Life in 1920 will follow the break. Using life in the 1920s as a case study, our special guest speaker Gena Philibert-Ortega will look at sources for learning more about the era and the people living during this time. We will explore fashion, home management, occupations, membership organizations, news, historical events, entertainment, and more. We will then discuss how to conduct social history research in any era. 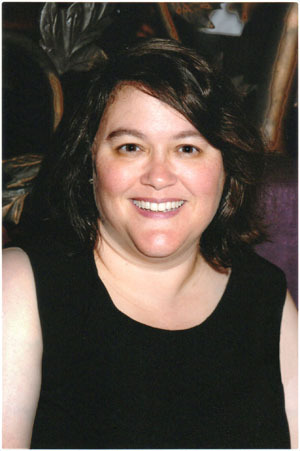 Gena is an author, researcher, and instructor whose focus is genealogy, social and women's history. Her published works include two books, numerous articles published in magazines and online, two volumes of Tracing Female Ancestors (Moorshead Publishing), and a QuickGuide from Legacy Family Tree, and she is the editor of the Utah Genealogical Association’s magazine, Crossroads. The handout for Gena's presentation is available for PCGS members in the Secure Download area. You do not have to be a PCGS member to attend, but you do have to be a member to download the handout. 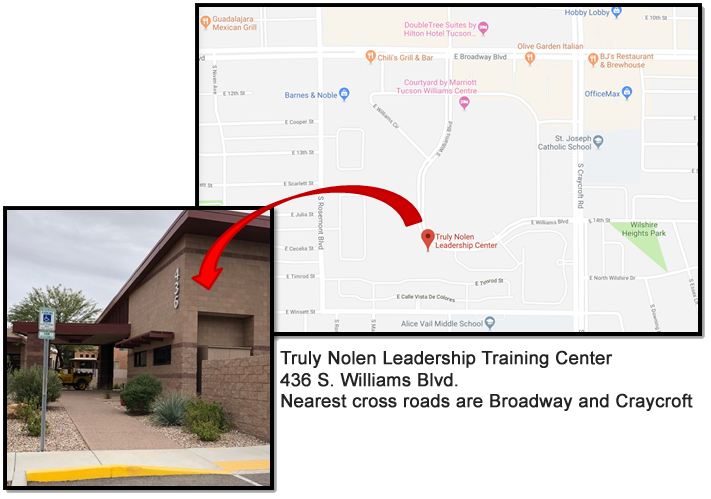 Beginning in 2019, we meet at the Truly Nolen Leadership Training Center, 436 S. Williams Blvd. Only our monthly meetings and the Family Tree Maker SIG are affected by this change. Reference our blog post We've Got a New Home! for details. Our logo is based on the state flag of Arizona which “represents the copper star of Arizona rising from a blue field in the face of a setting sun” (quote from legislation). The 13 gold and red rays represent the sun setting over the western desert and the original 13 colonies. Red and gold colors were also carried by Coronado’s Spanish expedition in search of the Seven Cities of Cibola in 1540. The center star signifies copper production. Arizona produces more copper than any other state in the country and one of its nicknames is the Copper State. The field of blue is the same liberty blue as the United States flag. Blue and old gold are also Arizona’s official state colors. For more information about the state symbols of Arizona, visit the Arizona page of the State Symbols USA website. PCGS members who are professional genealogists and accept clients (paid or pro-bono) may be listed in a PCGS Professional Genealogist Online Directory. The directory will be publicly available on the PCGS website, but only PCGS members are eligible to be listed. If you are an active PCGS member and would like to be included in the Professional Genealogist Online Directory, please fill out the pdf form under Members Only > Secure Download > Pro Genealogist Directory Form and email it to webmanager@azpimagensoc.org. Our Society runs on volunteers. Below are the most critical positions needed immediately. Please consider contributing your time and talents to these areas. Work with established committee to develop and plan subject matter and obtain speakers for nine monthly society meetings per year. The 2019 program year planning is complete. We need a Program Committee Chair to head up the program committee for the 2020 program year planning, which should begin at least as early as May 2019. Please email president@azpimagensoc.org if you are interested in helping with this critical task. Get the Latest Society News in Your Email Inbox! Click on the Wordpress logo above or click on this link to get to our blog. On the right side of the screen you will see SUBSCRIBE TO BLOG VIA EMAIL. Enter your email address in the field provided and click on the Subscribe button. You will receive a confirmation email. Once you confirm that you wish to subscribe, you are done! To return to our homepage from the blog, simply click HOME at the top of the blog page. You do not need to be a member to subscribe to our blog. We also occasionally send emails to our members through our website (like when a new issue of The PCGS Researcher is published). 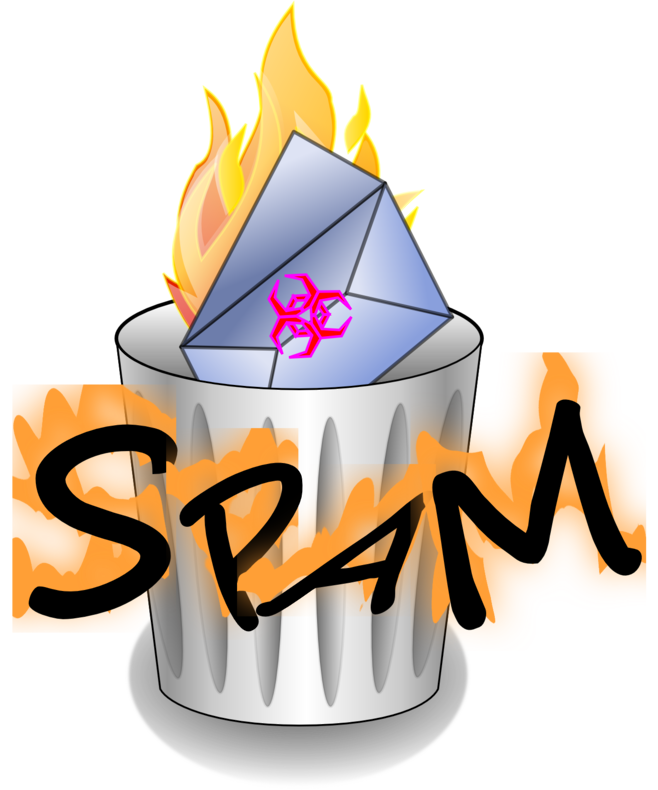 Please make sure your spam filters are set-up to include mail from our email server: @azpimagensoc.org. We will not fill out your spam filter requests for verification. It will be your responsibility to update things on your end to receive all your member benefits like newsletters and meeting reminders! Shopping for genealogy books and supplies? Access Amazon through our portal and Amazon will donate 0.5% of your eligible purchases to PCGS! This is your opportunity to choose from more than 150 lectures presented by many nationally recognized speakers, explore an exhibit hall filled with more than 80 exhibitors, and network with more than 2,000 genealogists. Every NGS conference has a different theme with a new program top to bottom—so there is always more to learn and discover. Watch their website for details visit the NGS conference page. The Big 50 for The Southern California Genealogy Jamboree. 50 continuous years of genealogy education, friendships, partnerships and offering the latest innovations in genealogy and technology. Come celebrate 2019 as we honor the past and embrace the future of Jamboree and genealogy. Watch for details http://genealogyjamboree.com/. Sacramento will host the second international conference of the International German Genealogy Partnership (IGGP). More than 700 people are expected to attend the conference to focus on the history and genealogy of those with German ancestry, wherever they live in the world. See the website for full descriptions and information. https://iggpartner.org. GRIP offers 17 courses in TWO week-long learning opportunities in Pittsburgh, PA, in 2019. Choose which week(s) to attend depending on your continuing education and research needs. 23-28 June 2019 and 14-19 July 2019. Registration will open 20 February 2019. For information: http://www.gripitt.org. AGS holds an annual conference every June. Held in a different location each year, the conference features lectures, demonstrations, exhibits, conservation and documentation workshops, classroom sessions, slide presentations, and guided cemetery tours. Registration will open in Spring 2019. For more information, visit https://gravestonestudies.org. MAAGI is the only African American focused event offering a total of 48 classes over 3 days with evening lectures, and guided personalized instruction. MAAGI 2019 will begin on Tuesday July 9th and conclude on Thursday July 11th, so come and join the Midwest African American Genealogy Institute family for a memorable and content rich experience! Visit their website at http://www.maagiinstitute.org/ for details and to register. The Institute of Genealogy and Historical Research (IGHR) hosted by the Georgia Genealogy Society provides an educational forum for the discovery, critical evaluation, and use of genealogical sources and methodology through a week of intensive study led by nationally prominent genealogical educators. Students choose one course that lasts throughout the week. Topics range from a course for beginners to a variety of courses on specialized topics. Visit the IGHR website for more details. The International Association of Jewish Genealogical Societies is sponsoring their 39th annual conference on Jewish Genealogy in Cleveland, Ohio. The conference includes more than 170 programs, lectures, panel discussion and workshops focusing on genealogy methodolgy, available archival resources, and the history of all Jewish communities. There will be in-depth DNA workshops. Visit the IAJGS website for more details and to register. The Federation of Genealogical Societies makes its first visit to the nation's capital with the National Archives, Library of Congress, DAR Library, and more a Metro ride away. For more information, visit the FGS conference page. Celebrate the 40th anniversary of the Association of Professional Genealogists at the one conference designed by professionals for professionals in Salt Lake City, the city where APG began. Attend advanced-level presentations you can't get anywhere else, network with genealogy pros from all over eh U.S. and beyond, and research at the Family History Libreary before and after the conference. Watch their conference webpage for details as they unfold. PLEASE NOTE LOCATION CHANGE. Get answers to your DNA questions, guidance on interpreting your results, and updates on what's new in DNA testing. PLEASE NOTE DATE CHANGE RootsMagic software users' general meeting to further their knowledge and share their expertise of the software. Get answers to your DNA questions, guidance on interpreting your results and updates on what's new in DNA testing.